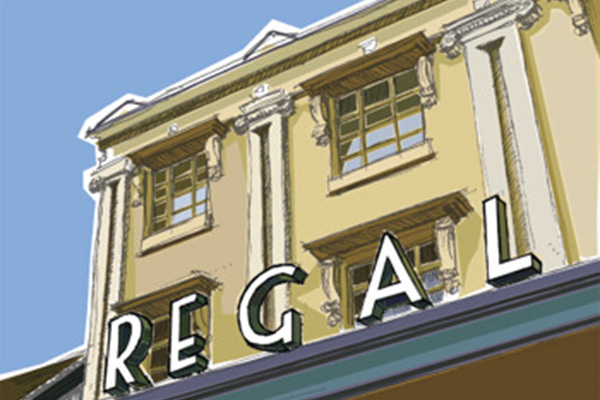 The Regal Cinema opened on Thursday July 29th 1937 but the building to which alterations were made in 1936 to construct the foyer, offices and projection room, had stood on the site for many years. 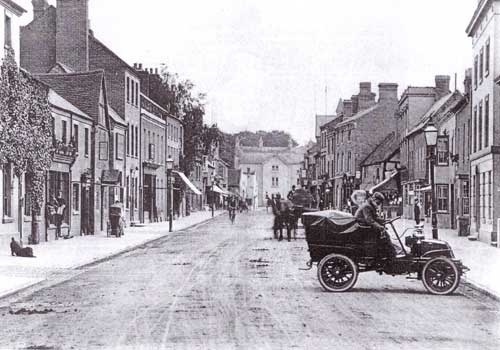 In this picture of 1904 the building looks very much like it does today. 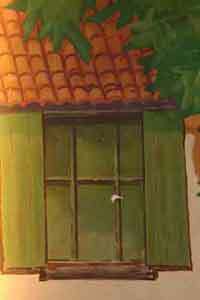 If you look closely you can see the awning outside one of the shops. 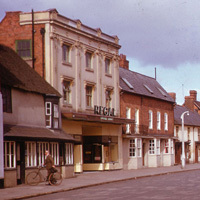 The cinema retained its Victorian front with its columns until 1969 when it started to fall down and was rendered over and lost much of its character. It was probably about this time that the regal neon sign was removed. W H B Ashley who sold 47 and 49 Teme Street to Mr. N J Robson of Craven Cinemas Ltd. is shown as head of the household on the 1911 census aged 39. His father William Ashley was living there in 1881 when WHB (William Henry Barnard) was eight. The Ashley family ran a plumbing business from 47 Teme Street while two of its members became solicitors clerks. 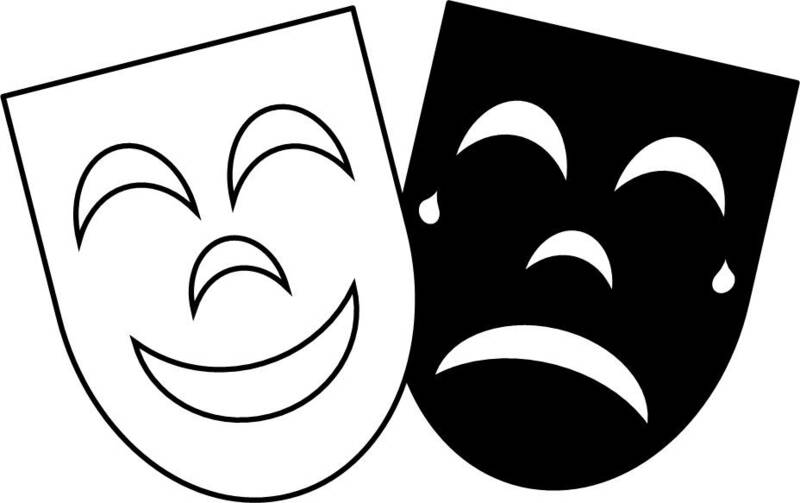 Who remembers Ashley and Davis solicitors of Tenbury? Perhaps the items hanging outside the shop in the black and white picture above are connected with the plumbing trade. There are still signs in Tenbury today of this connection, have you noticed these inspection covers in the pavement? 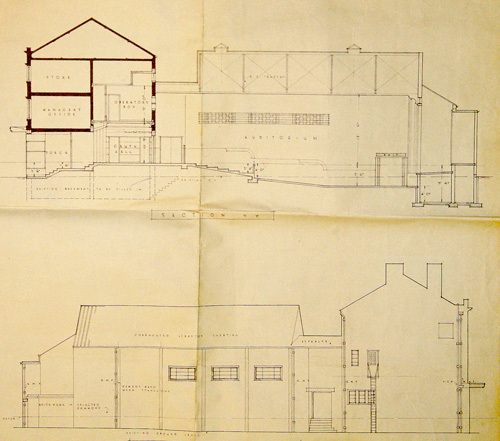 Ernest Roberts of Birmingham, a specialist cinema architect designed the building, his 1936 plans shows a basement and a single pitched roof to replace the double pitched roof over the original building. 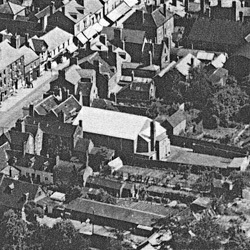 The single roof was never built as can be seen from the 1939 aerial photo below; the inside of the attics above the foyer still contains old rafters and is in a very poor state of repair. Mr. Winny, of the firm of Messrs Medlicott and Winny, solicitors for the Craven Arms Cinema Co., addressed the magistrates regarding the proposed cinema to be erected on the site of the present shops, Nos. 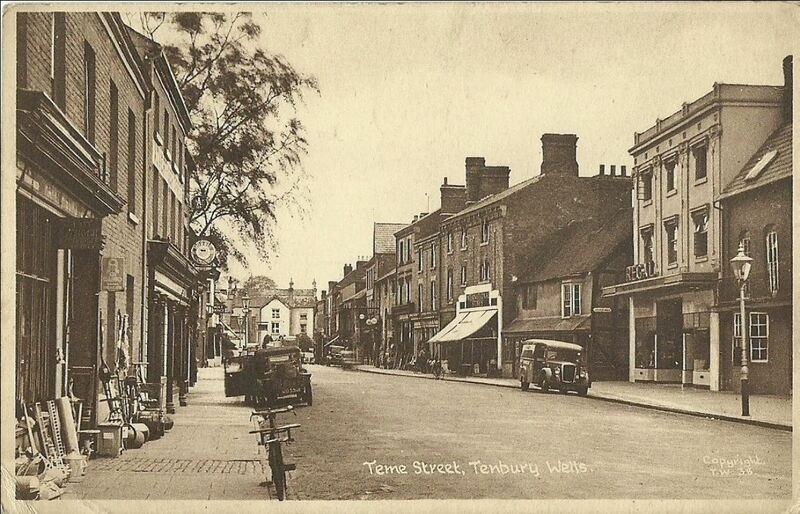 47 and 49, Teme Street, Tenbury, belonging to Mr. W. H. B. Ashley. 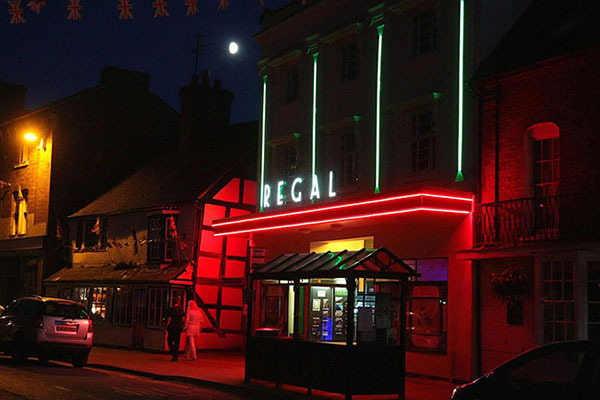 It was proposed to make structural alterations to the existing premises to provide a cinema accommodating 316 persons, the cinema to have a twelve feet entrance, with a booking office, etc., and two lock-up shops. 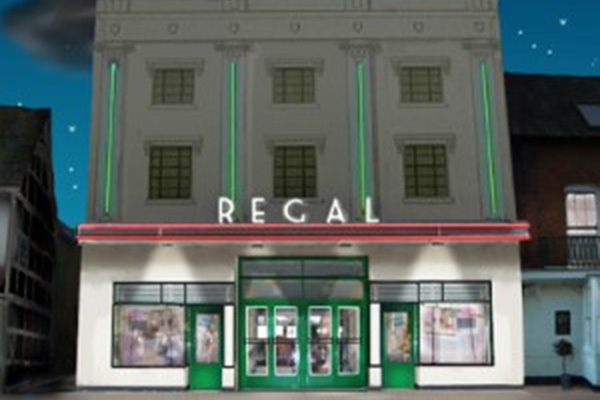 Mr. Roberts, of Birmingham, a specialist in cinema architecture, had drawn up plans which were submitted to the bench for approval. 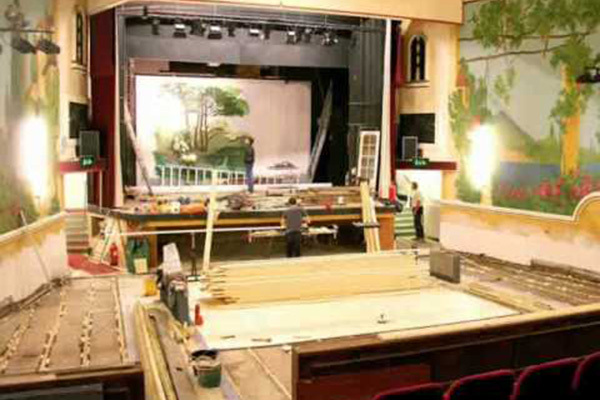 The roof of the cinema was to be covered with sheet asbestos, similar to the cinema at Craven Arms. An exit would be made into Church Walk, and two exits on ground at the rear of the building. Mr. Winny pointed out that the erection of the cinema would not create opposition with the present cinema because this would be closed down, and Mr. A. J. Smith would be the resident manager, and Mr. Robson, who was also the proprietor of the Craven Arms cinema, would be the proprietor. 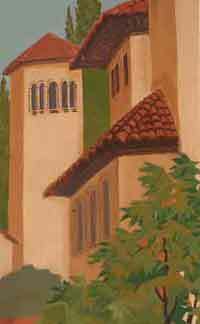 Everything would be done to secure proper safety to patrons, and ample exits supplied. Supt, Gregory considered the plans were very good, and so long as they compared with the provisions of the Act, the police would approve of them. The exits and entrance appeared to be quite in order. The magistrates granted provisional approval of the plans. Subject to the approval of the county architect. 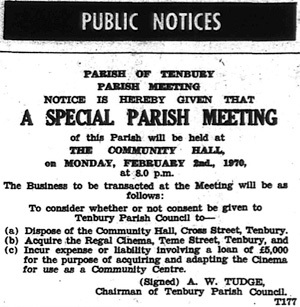 Since the first day that the work of building a new cinema began in Tenbury the whole inhabitants of Tenbury and neighbourhood have watched with great interest the daily proceedings taking place. 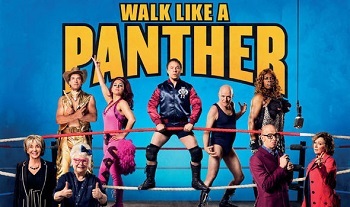 On Thursday afternoon a complimentary performance was given before the magistrates of the local Petty Sessions, members of Rural District Council, Parish Council, Police and employees engaged in the building of the Regal. 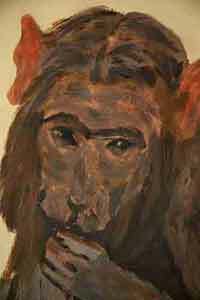 In the evening there was a queue at opening time and a "full house" witnessed a splendid projection of the announced programme " Everybody Dance " Them Thar Hills" and "Good Little Monkeys." 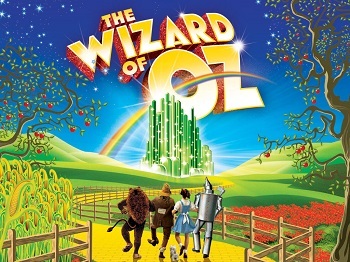 There was a five minutes interval, and with full lighting effect the whole auditorium could be seen and the brilliant work of the artist, Mr. George Legge, appreciated. 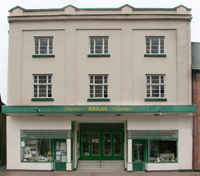 The Regal closed as a cinema in 1966; over the next few years several schemes were put forward for use of the site, including demolition to turn it into a car park. In 1970 The Parish Council held a public meeting to seek consent to purchase the cinema on behalf of the community, work began on plans to use the land behind the cinema for a community centre, to satisfy planning regulations it was necessary to clad a wooden building with brick. The community centre opened on the 7th December 1972. 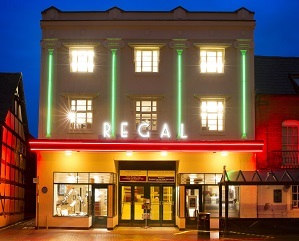 Other alterations were made to the Regal, the stage was extended forward to make the cinema useable as a theatre and work was necessary to the roof, particularly the part pre-dating 1900. In 1977 the murals were repainted under the supervision of a local artist and with the help of youngsters sponsored by the Manpower Services Commission, a Government body that made funds available for the wages of young unemployed. 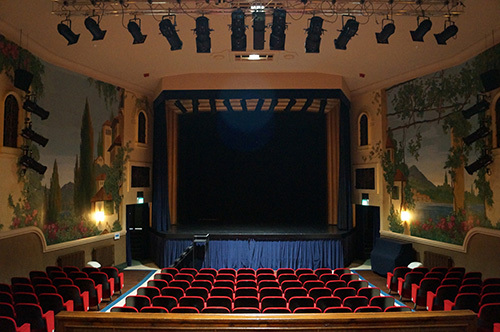 Ernest Roberts was at some time in partnership with architects Satchwell and Roberts designing cinemas for Sidney Clift (later Sir Sidney lift) who gave his name to the many Clifton Cinemas such as The Clifton Leominster and The Clifton Ludlow. 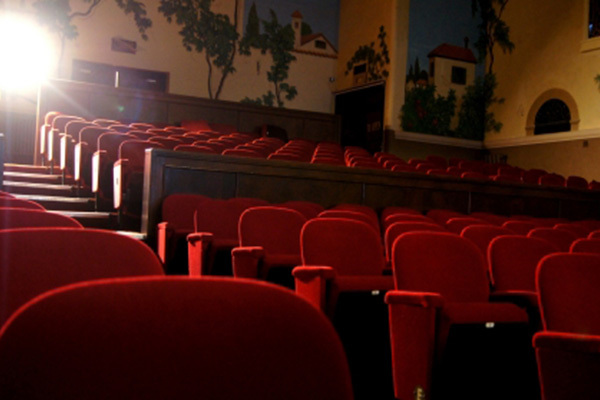 Earnest Roberts was also a Director of Clifton Cinemas Ltd. An other company formed to provided equipment and management services was known as Cinema Accessories Ltd. This website has been contacted by Mrs Farrington who tells us her Grandfather was part of the building team in the 1930's. 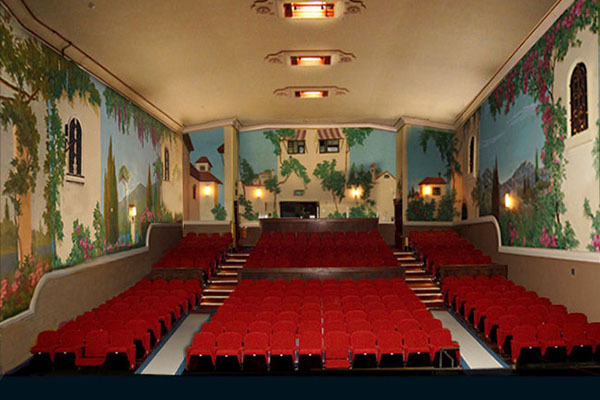 Scenic artist George Legge of Bryan's Adamanta who painted the murals in the Regal Tenbury worked on many cinemas in the Clifton chain. 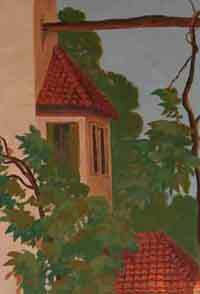 In Ludlow he painted hunting scenes on each side of the screen. 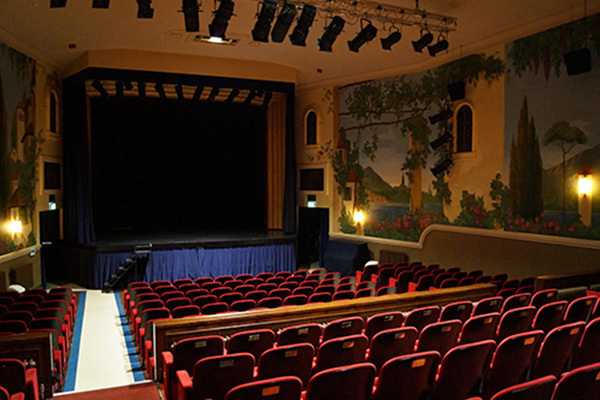 The interior of the Regal Church Stretton and the Regal Craven Arms looked very similar to the interior of the Regal Tenbury.